The area in which embryos are handled should be indoors and ideally in a room separate from the embryo collection area. The area must be isolated from exposure to aerosols arising from sick animals and people. To reduce the incidence of microbes, dust, and chemical contaminants, it is recommended that laboratory work surfaces be washed regularly with soapy water followed by, first, a thorough clear-water rinse and, second, an alcohol (70 percent) rinse. Alternatively, surfaces could be washed with a mild disinfectant that is relatively non-toxic, but is yet a good solvent (e.g. quaternary ammonium or ampholytic compounds). Surfaces must be allowed to dry thoroughly before they are used. In addition, proper techniques must be followed scrupulously when handling embryos. For example, if pipettes must be set down for a short time while manipulating embryos under the microscope, the tip must not be allowed to touch any surface (see Figure 32); likewise, containers of medium should be kept covered. The temperature of the room should be within the range of 15–30°C. The ideal humidity is 30–70 percent, but this is not a critical factor and need not be taken into account unless, for other reasons, it is desirable to install a special room with controlled environment. Similarly, positive-pressure air filtration reduces the risk of contaminating equipment and containers of embryos; however, unless there are unusual amounts of air-borne micro-organisms and dust, such precautions are not required. The presence of insects should be avoided, but special care must be taken to ensure that chemical control measures do not result in aerosols and surface residues that might contaminate equipment or solutions. Glassware and equipment made only of metal (e.g. cervical expanders or stylets for Foley catheters) should be scrubbed thoroughly on all surfaces in a basic detergent, soaked in an acidic detergent, and subsequently rinsed 12 times in tap water and 12 times in distilled, deionized water. Adequate rinsing is essential because all detergents are embryocidal. Glass- and metalware should be wrapped with aluminium foil to protect from contamination any surface that may come in contact with embryos or the reproductive tract of the cows (e.g. mouths of flasks and bottles should be covered, watch glasses should be completely wrapped, as should cervical expanders), and then sterilized by dry heat at 160°C for two hours. An alternative is to wrap the items in cloth, paper or other material that allows steam to evaporate but that provides an effective barrier to micro-organisms, and then sterilize them by moist heat (a temperature of 121°C at a pressure of 104 kilopascals for at least 30 minutes; Manual of the International Embryo Transfer Society, 1987). Sterilization by dry heat has the advantage of not exposing equipment rinsed in distilled, deionized water to possible contaminants in the water used to produce steam. Moist heat under pressure has the advantage of killing highly resistant bacterial spores, provided that sufficient time is allowed for sterilization. An indicator, such as heat-sensitive tape or dye, can be used to verify that desired temperatures have been reached. 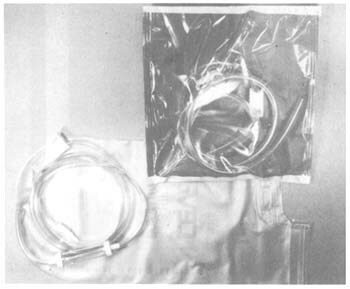 All reusable heat-labile items, such as catheters, tubing, or searching dishes, should be disassembled and washed in the same manner as glassware. After they have dried completely, they should be wrapped and sealed in a gas-permeable paper (Figure 33). The recommended sterilization procedure (Manual of the International Embryo Transfer Society, 1987) is exposure to at least 500 mg of ethylene oxide per 1 000 cm3 for 24 hours. Ethylene oxide is highly embryocidal and residues can take 24 hours to months to dissipate, depending on the concentration of ethylene oxide, duration of sterilization, material sterilized, the type of packaging, and aeration conditions. 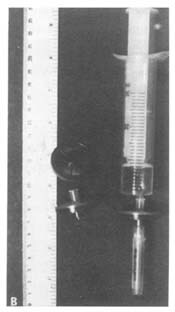 Aeration for one week at room temperature should be adequate for most materials (Schiewe et al., 1985, 1988). A heated aerator or an evacuation hood are useful pieces of equipment, but are not required. Staff must take precautions to avoid contact with ethylene oxide because it is highly mutagenic. Solutions should be prepared with pure water. This can be obtained from sophisticated deionizing and filtration systems or from water distilled in glass stills. At least two distillations and sometimes more are required to obtain suitable water. Basic salt solutions (e.g. sodium chloride) can be decanted into 500-ml (or smaller) screw-cap bottles and sterilized by moist heat as outlined above. Bottle caps should be loosened before sterilization and tightened afterwards. 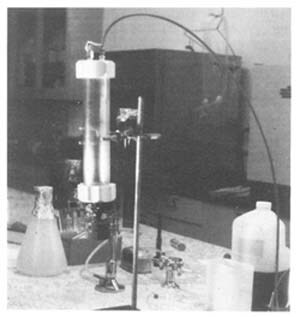 More complex solutions should be sterilized by membrane filtration with 0.22-μm pore size (Figure 34), taking care to use positive pressure to avoid frothing and unacceptable changes in pH (Manual of the International Embryo Transfer Society, 1987; see also Chapter 6 on culture of embryos in vitro). It may be helpful to filter solutions preliminarily using a 0.45-μm pore size to reduce the likelihood of clogging the finer membrane during sterilization. Some workers siliconize pipettes used to handle embryos. It is especially useful to siliconize glass micropipettes for microsurgical work. Directions of the manufacturer should be followed in siliconizing equipment, which must be washed and rinsed thoroughly after siliconization and then sterilized. The advantage of siliconization is that debris and embryos are less likely to adhere to the treated surface; this also makes cleaning easier. As an added precaution, all equipment, whether taken directly from the manufacturer's package or sterilized at the embryo transfer unit, should be rinsed just prior to use with sterile medium. Under no circumstances should equipment be used for more than one cow or more than one group of embryos without first being washed and sterilized. Equipment to be sterilized and used again should be disassembled and put to soak in soapy water as soon as possible after use.